As the Jammu and Kashmir government’s order banning movement of civilian vehicles on the highway between Udhampur and Baramulla went into force Sunday, political parties took to the roads “defying” official orders, and called for the revocation of the ban. Former Chief Minister Mehbooba Mufti said she would challenge the government’s order in court, and urged the people to defy the ban on civilian traffic. “If the Government of India thinks that by doing such things they can suppress the people of the state, they are wrong. We are defying this order and also filing a petition in court tomorrow. Kashmir belongs to Kashmiris, and for them to have to seek permission to use their own roads, I will not let this happen,” Mufti said in Panthachowk on the outskirts of Srinagar. “Protested against Guv [Governor] admins [administration’s] callous & absurd ban today. How can you restrict civilian movement on our main highway? You want to smother Kashmiris, change the demographics of the state & imprison them in their own land? Over my dead body,” she posted on Twitter after the protest. The order issued by Governor Satya Pal Malik’s administration on April 3 seeks to make it easier for convoys to move between the winter and summer capitals of the state by stopping all civilian traffic on a 270-km stretch of the national highway on Sundays and Wednesdays. The order has cited “Parliamentary Elections and associated possibility of any fidayeen terror attack on Security Forces’ Convoys,” as justification for restricting civilian traffic on the highway on the specified days of the week till May 31. VVIPs are outside the purview of the ban, “subject to movement of traffic”, a senior government official said. As such, National Conference vice-president Omar Abdullah was allowed to travel to Uri in North Kashmir, and Mufti to Beerwah in Budgam district, to campaign for the Lok Sabha elections Sunday. The administration has made exceptions for schoolchildren, government employees, emergency services, and tourist vehicles, after due scrutiny. Magistrates have been appointed to facilitate movement of traffic where needed. The civilian population has been informed that passes can be sought from magistrates deployed on the spot or from the offices of district magistrates in the districts along the national highway. Magistrates were also issuing one-day-passes to passengers who needed to travel on the highway in case of emergencies. In an official release Sunday evening, the J&K government said “elaborate arrangements (had been) made by the Government for the convenience of the public”. The government also said that a very large number of vehicles were allowed to cross the national highway at various crossings in all districts, adding that in Srinagar, over 2,000 civilian vehicles crossed Panthachowk for various destinations along the highway. 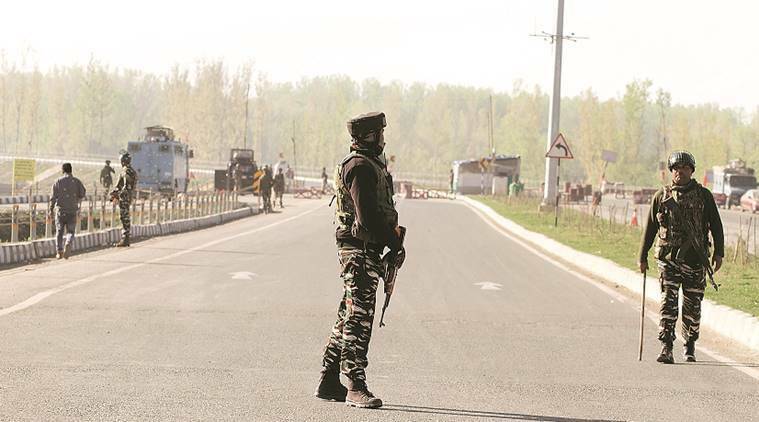 While the highway was closed to civilian traffic on Sunday, there wasn’t any extra movement of Army and paramilitary convoys from Jammu to Kashmir. “It was a little less than the routine movement,” a senior police officer posted on the highway told The Indian Express. “Only one Army convoy — of less than 30 vehicles — entered the Valley, and we are expecting one more convoy by the evening,” the officer said. Officials said that the full impact of the closure of the highway to civilian traffic would likely be felt on Wednesday, which will be a working day.